He is by far the most gentle dog we have ever had! 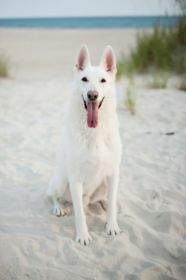 Here is a Picture that was taken on the beaches of North Carolina on his 10th Birthday. Look how handsome! We could Not imagine our lives without him! Thanks so much for sending in the gorgeous picture of your handsome birthday boy! And he looks so at home on the beach - in fact, he almost looks like a giant sand sculpture. What a talented artists that would be to make such a handsome creature! Good luck to you both and here's to many, many more birthdays for Sport.